Since it opened its doors to the public in 1991, the Athens Concert Hall has been regarded as one of the most comprehensive culture centres in Europe. Its superb acoustics has been acclaimed both by the public and by renowned performers of the music and art world. The Athens Concert Hall has welcomed top class artists, music ensembles, composers, conductors and performers in an artistic trajectory that has left its mark in the country's culture scene. 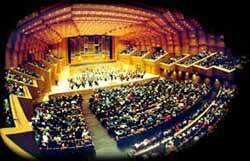 The Athens Concert Hall attracts thousands of people who come to enjoy its many art events and performances. Athens Concert Hall, 1 Kokkali street and Vasilissis Sofias Avenue, tel 210 7282333.